Not bad! 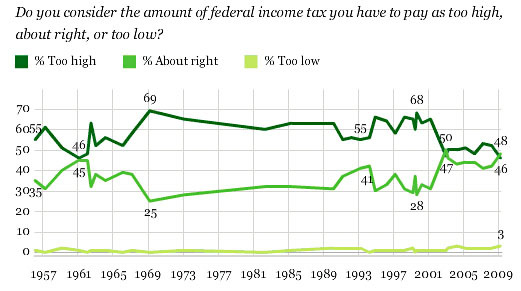 49% think their income taxes are just fine or even a bit low. Except for one thing: this chart shows exactly the opposite of what it seems. Consider this: about 40-50% of Americans pay no federal income tax at all1. That’s zero dollars. I think we can safely assume that these are the people who think their taxes are about right. What this means, then, is that virtually every American who pays any income tax at all thinks they’re paying too much. There are various reasons why this might be so (a sense of unfairness regardless of amount paid, a fuzzy sense of how much they’re paying in the first place, simple bloody-mindedness, etc.) but overall it’s not exactly a testament to our collective willingness to fund the machinery of state. 1Of course, all of them pay other taxes. There’s more to life than just the income tax. But this question was strictly about federal income tax, and it demonstrates that nearly everyone with a nonzero 1040 payment thinks they’re paying too much.